Gifts are an excellent way to build client and employee relationships. People love to be remembered and recognized, particularly when least expected. The surprise of a carefully-chosen gift can go a long way towards building good-will and turning a one-time sale into a long-term customer. Many companies include regular gift-giving as an important part of their marketing strategy. But it’s important to select a gift that is not only memorable but also tasteful. We’ve all heard the old adage, “It’s the thought that counts.” This may be true, but careless or improper gift-giving can do your cause or relationship more harm than good. Gifts are never a substitute for a caring attitude, good business practices, goodwill or company manners. Business gift-giving has come a long way since Harry and David graduated from selling fruit at a roadside stand into mail order back in 1948. A lot of products have been introduced, tried, and then discarded as appropriate gifts for business customers and employees. Chocolate-covered ants, introduced at the 1963 International Fancy Food Show, are a good example. The large tins of popcorn have become so inexpensive and commonplace that companies, in the know, now avoid them. The once-popular gifts of alcohol and tobacco-related products are inappropriate unless you are sure they will be appreciated. The Christmas holidays is the most popular time for business gift-giving. But the true experts know that choosing a time when gifts are least expected, such as Thanksgiving, New Years, or even the middle of summer, has a larger impact. Being aware of cultural differences avoids offending or sending the wrong message. For example, not everyone celebrates Christmas or Halloween. International gift-giving has its own set of protocol depending on the individual country. The gift should be appropriate to the business relationship and can range in price from a few dollars to several hundred. It is important that the recipient not feel uncomfortable when accepting the gift. Gifts that are so extravagant that they could be misinterpreted as bribery should be avoided. 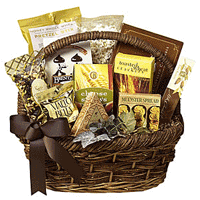 Gourmet gift baskets are one of the most popular year-round business gifts. Flexible enough that they can be designed for any occasion, they can be personalized just for you and your business. Having the ribbon imprinted with your corporate name adds an elegant touch. A little extra time spent learning the recipient’s likes, dislikes and interests goes a long way towards showing a customer or employee that they are important to you. When tempted to buy a gift basket off the shelf at a discount or department store, be aware that the recipient may shop there too and know exactly how much you spent and how little thought went into selecting the gift. Wrapping and presentation is as important as the gift itself, oftentimes making an inexpensive gift appear elegant. While a mug or other gift imprinted with a corporate logo provides free advertising, it is not always appropriate or as impressive as you would like. But when combined with foods and/or other gifts and topped off with a gorgeous bow, it can create quite an impact for very little money. Delivering your gift in person is always a nice gesture. But, if you can’t, the surprise of having it delivered is also special. Even when delivering your own gift, include a card with a personal comment and signature. Gift-giving is an excellent way of showing appreciation to customers, clients, and valued customers. A little knowledge and thought can make it a pleasure instead of a dreaded chore. Joyce Reid is owner of Creative Gifts To Go LLC, a Flagstaff-based nationwide gift and gift basket company specializing in personal and corporate gifts, Gift Basket Network, a directory of gift basket professionals dedicated to quality products and service, and GiftRetailersConnection, a community and digital magazine for gift retailers..